It was terrific to see so many people tonight at our Chinese meal fundraiser. 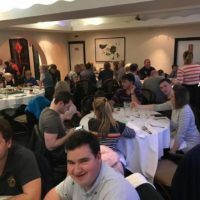 The evening had fantastic food, a great atmosphere and best of all we raised £559 for 3rd CB. A big thank you must go to Fortune Garden for hosting us, June Store Coffee & Donuts for donating gifts and to the fundraising team for organising the event. Further fundraising events are being planned, so we look forward to seeing you all at the next one!